It’s up to us–the parents, grandparents, and adults–to give “our” children the tools they need for “the now” and “the then” in their lives. To do this, we must have the necessary knowledge to conduct ourselves in a Godly manner—and then we must live that life before them. The future of the church, our society, our country, and our world depend on what we give to our children, how we teach them, and what we model as their examples. We don’t need to teach them how to use tools for operating electronic devices, storing data in the cloud, or creating a car from a 3D printer. They can teach us, starting at a very young age. What our children need from us is the vocabulary, knowledge, understanding, and proper usage of these “tools” in life: patience, responsibility, respect, determination, goals, endurance, perseverance through trial, devotion, integrity, a good work ethic, keeping one’s word, priorities, sacrifice, putting others above self, love for one’s family/neighbor/church family, empathy, knowledge and understanding of the Word, practice in living the Word, the importance of placing God above all else, servitude before the Lord, and more. Christ is the Light, but we must be the mirrored reflection of His example for our children. As He trained us when we were but “babes” still on the “sincere milk of the Word,” ³ so must we teach and lead our children from a young age to follow the right path in order to secure their present and future—and the future of the world they will live in. 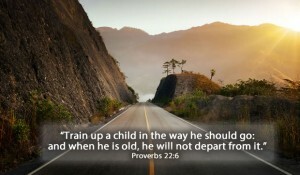 **(King James) Train up a child in the way he should go: and when he is old, he will not depart from it. 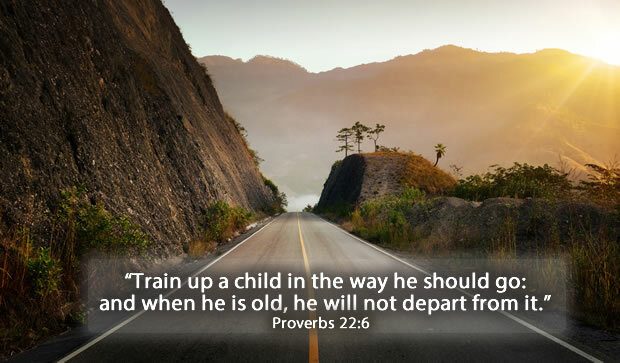 **(New International Version) Start children off on the way they should go, and even when they are old they will not turn from it. **(The Message) Point your kids in the right direction—when they’re old they won’t be lost. ** (Good News) Teach children how they should live, and they will remember it all their life. It’s on our shoulders. We have the responsibility for the present, the world our children see and experience as the preparation and guidance for their future–a future they will mold and shape based on how we trained them, started them off, pointed the way, and taught them how to live. A bedraggled man with scraggly beard and uncut hair, sweat-stained and dirt-laden face, wearing torn and soiled clothing, walks down dusty paths in worn sandals. A prostrate man lies in the dust, fervently praying, tears infused with blood flowing down, soiling the face, staining the tunic. A bruised, weakened man, scarred and bloodied, thorns embedded in unkempt hair, drags a cross, falling under the load, face buried in the dirt. A half-clothed, broken man, suspended on a cross, sinks into the nails, gasping for breath, in agonizing torment with each living moment. But what is this beauty that is spoken of in these songs of praise? Living in a culture so focused on outward appearance and good looks, Jesus would not pass the “handsome man” test. His beauty is an inner one, reflected through His goodness, His purity, His compassion, His obedience, His sacrificial love, His pierced hands and side, His risen soul. 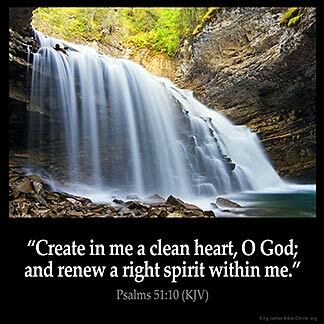 When we face ourselves in a truth-rendering inner search, confronting our reflections in the mirror of our souls, we should see these qualities of Jesus in our hearts, in our eyes, in our tears, in our smiles, in our scars. Here, in this physical world, we can only hope to be but a dim reflection of the Lord. One day, we shall meet Jesus “face to face.” Will He see the mirror of Himself in us? If our reflection is true, then we will know His full Beauty, as we dwell with Him forever, His image surpassing the likeness of ourselves in the mirror of His grace. Heart Whispers: Do We Hear Them? “I am hurting; I am sad. Can you help me? Do you hear me? When we listen loud enough. 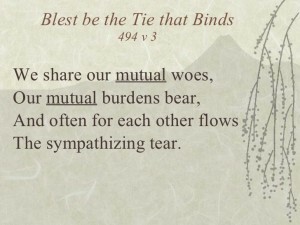 We are commanded to help each other and share the burdens and sorrows of our brothers and sisters in Christ. Can we hear their heart-sounds whispering to us? Do we listen loud enough? Recently, eight women from this church prayed the directory of this membership. In looking down the list of names, heart-sounds began whispering to us. We could hear the hurts, the sorrows, the disappointments, the regrets, the frustrations, the struggles, the pains, the burdens, the loneliness, the concerns, the fears, the losses, the needs, the wants, the hopes . . .
And we prayed the whispers. God will always hear the whispers of our hearts, but for us to hear what is unspoken, we need Jesus in our own heart to help us listen to the murmurs. Let us know each other more deeply–beyond the surface, beneath the laughter—and listen with our hearts, more like Jesus. 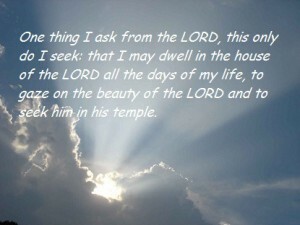 “. . .The LORD does not look at the things people look at. People look at the outward appearance, but the LORD looks at the heart.” (I Samuel 16:7) In order to “carry each other’s burdens,” we must also look at the hearts of our brothers and sisters—and listen loud enough. ¹The LORD is my shepherd, I lack nothing. “Most of the things we need to be most fully alive never come in busyness. REST. QUIET. In our busy world, it is very difficult to find either. Even when sleeping, we may not be truly resting. We toss and turn, our minds filled with concerns of the day and worries of tomorrow. Then the alarm suddenly goes off. So soon? We hit the snooze button in an attempt to capture that little extra moment of rest, which is never enough–so we push the button again and again . . .
God knew the importance of REST: “Then God blessed the seventh day and made it holy, because on it he rested from all the work of creating that he had done” (Genesis 2:3). Jesus knew the necessity of REST: “Then, because so many people were coming and going that they did not even have a chance to eat, he said to them, ‘Come with me by yourselves to a quiet place and get some rest’ ” (Mark 6:31). rest and quiet can only be found in Jesus. Shh. Slow down. Seek quiet time. Be tranquil. Be still. 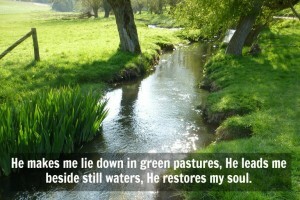 Find comfort and restorative solace in Jesus. 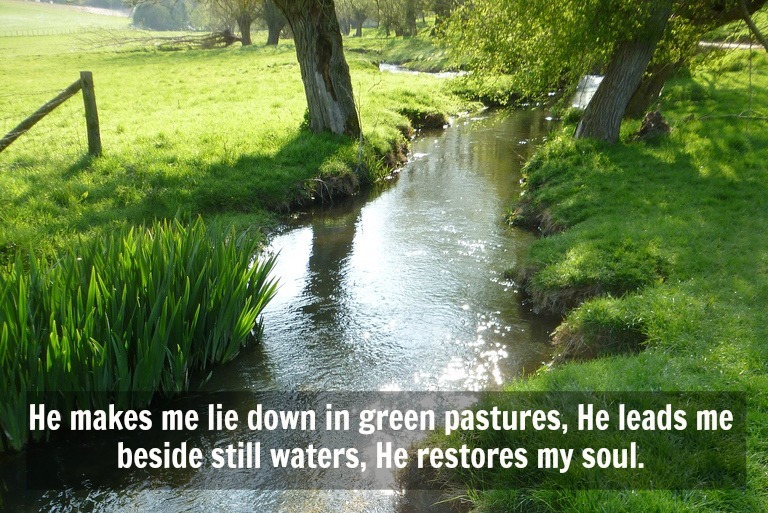 A peaceful, serene, untroubled REST and QUIET awaits us in the presence of the Lord, our Shepherd. ¹ The LORD is my shepherd, I lack nothing.